Unlike beer and whiskey clubs, it seems really hard to find good cheese in my area. I'm in California, so there's no shortage of it, but I live in a small-ish town, so we don't really have access to it. Perhaps because unlike beer and whiskey, it doesn't store well. You need to refrigerate, deliver, and consume within a specific period of time. Whatever the reason, I simply don't have much to choose from at my local SaveMart or Raley's other than mozzarella and camembert. I could drive 20 minutes to a nearby city, to a single store that has a cheese monger, but even then, the selection isn't as extensive as you're going to find in cities like LA or San Francisco. 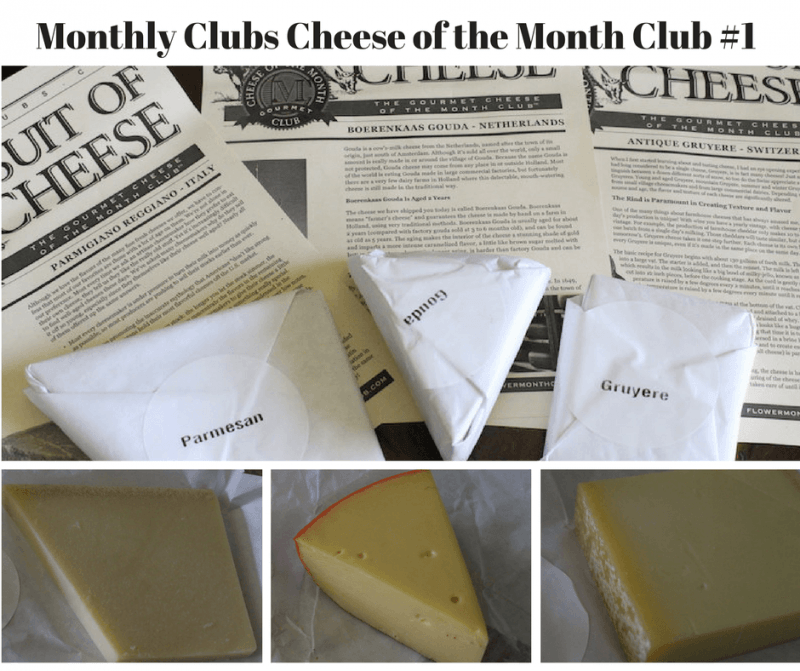 Enter: Cheese of the month clubs! I joined about six different clubs, each offering a different style of offering. Both MonthlyClubs.com and Amazing Clubs [LINK] offer a similar club, for a similar price: three cheeses for about forty bucks including shipping. Monthly Clubs delivers their cheese in an small, unassuming cardboard box. Inside is a styrofoam container with ice packs to keep the cheese cool. Even in the hot California summer (100ºF +), it still arrived cool, although if your cheese is warm, that's not a big deal. Just refrigerate it again and it should be fine. I was at home to get the cheese immediately, so if it's at 100º for eight hours, that might be a different story! Amazing cheeses were delivered for my first box. I was impressed. Each piece was wrapped in wax paper, and looked truly authentic, like from a legit cheese monger. I could just imagine the giant cheese wheel they were cut from. My favorite was the Antique Gruyere. I had never had something like this before. The tasting notes described it as having a flavor of caramel, brown sugar, and melted butter. That's why I like reading the tasting notes: they can really enhance your eating experience! The Gouda was aged two years, which was surprising to me. That sounds like a long time for a piece of cheese. I pretty much just ate this with crackers throughout the week. Soft cheeses go fast. The parmesan was pretty standard, but it was high quality. I used this for a lot of things. parmesan lasts for a while. I put it in a risotto and on some spaghetti with red sauce. The second delivery from Monthly Clubs Gourmet Cheese club was slightly less impressive, though still good! To be honest, I was busy this month, so didn't read the notes. I didn't quite know what to do with the Pinconning, so I just ate it with crackers again. The Edam went similarly. The Piave seemed pretty much like parmesan, so I used it for risotto again. My favorite was the Piave though, and I will keep an eye out for that one. It was like parmesan, but clearly different. The flavor was definitely unique. Once my other reviews are done, I'll add more extensive info here about price comparisons, but it's hard to compare when other clubs include fewer cheeses, but also include more food and drink. For now, I'll compare to Amazing Clubs and Clubs Galore since they both offer the three cheese option. You can see how the price changes now! Of course, this is assuming you want the minimum amount of months for a trial period. But if you choose 3 months or more for Monthly Clubs, then you can look at the actual month-to-month cost. So far, I've only had two months cheese clubs, so I can't tell if one has higher quality of product than the other. My impression is that Monthly Clubs has a higher quality selection. I have enjoyed all cheeses they sent. Amazing Clubs had two selections which I was lukewarm about. I'll update after month 3 of Amazing Clubs! My other cheese clubs are still coming along, so I don't have a lot to report right now. I'll update more when I have details and links to full reviews. However, there are two great things I can say about Monthly Clubs Gourmet Cheese Club versus the other clubs. I ordered at least 5 different cheese clubs at the end of July. Monthly Clubs delivered within a week. About half the other clubs didn't deliver their first shipment til the end of August. Also, most other clubs require a 3-month minimum when you order a set amount of deliveries. A lot of clubs do offer a month-by-month payment system, but if you pre-order, you need to commit to at least three months. So I am stopping the Gourmet Cheese club early just to save some money, which is why I finished this review first. I will also just note that some other clubs include things like wine and food to pair with the cheese. They are usually more expensive, and include fewer cheeses, but more details on that soon. Who is the Gourmet Cheese Club Best For? If you love cheese, or know someone that does, this is a perfect gift…even if it's a gift for yourself. If you are like me, and stuck in an area without access to specialty cheeses, this is also a good club for you. Even if you can go to the store and buy anything you want, just having access to the newsletter with tasting and pairing notes can really enhance your tasting experience. $48/month is a lot to pay for three chunks of cheese. That's $16 per 1/2 pound of cheese! However, there's more to factor in here. We're cultivating a cheese-loving experience. It's hand selected artisan cheese delivered to your door. It comes with tasting notes and cooking suggestions. A cheese of the month club is about enjoying cheese to the fullest, not just about getting the best deal. Otherwise, we'd all be eating cheddar from the discount aisle. In short, this makes a great gift for a few months. I think a 3-6 month gift would be a great Christmas present or birthday gift for any cheese lover or cook. Combined with a beer club or wine club, it would be an amazing gesture. Even for yourself, it could be a great way to test the waters of artisan cheese and have help to navigate the complex world artisan food and drink. 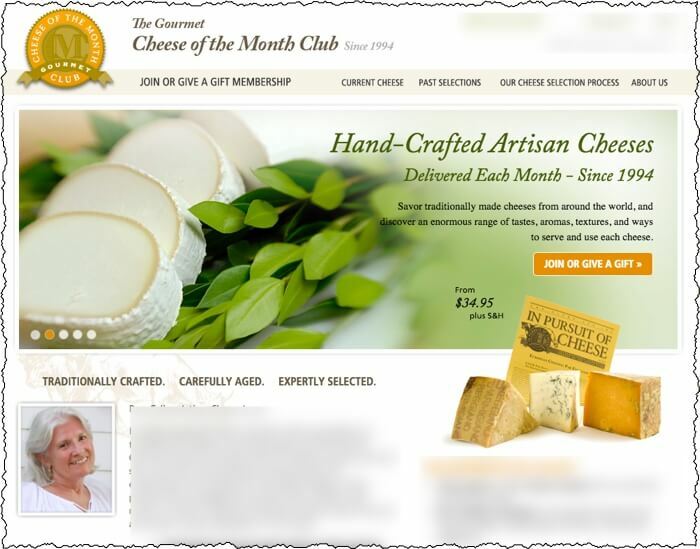 ==> Sign Up For Monthly Clubs Gourmet Cheese of the Month Club! Can I ask do they shipped these monthly cheese overseas? I am living in Malaysia and I would love to enjoy these monthly cheese deliveries. Unfortunately, the cheese of the month club will not ship overseas. It’s just too much to handle to get the goods over such a long distance and keep them cold the whole time! I am a cheese lover but too bad that they don’t ship it overseas , and i know when it’s shipped, it can effect the quality of the cheese as well. thank you for reviewing this kind of club ! i have to agree that cheese can fit with wine,beer or even vodka? This is really interesting. I have never thought of joining a cheese club. It is a really fun idea if you are really interested in it! I think it is cool that it sends you a letter with it letting you know what pairs well with it. I feel so often that I don’t even try new cheese because I don’t know how I am supposed to prepare it or what to pair it with. Yeah, personally, I really like the information included so I can learn about the different cheese! Eating is one thing, but knowing what you’re eating is the most intersting part. Thank you for posting this. I am a cheese lover, and I do not think $48 per month to try different cheeses is too much to pay. I live in a very rural area and my local supermarkets do not even carry blue cheese, which I love. I always use provolone cheese on my pizza when I make one. There are so many different cheeses that I have not had the chance to try, so these clubs will be perfect for me. I will sign up for one because I can share these with my friends because, like me, they do not have access to a good selection of different cheeses. Which club do you recommend, Clubs Galore? I guess I’m lucky to live in California, where, even small local places carry at least blue cheese! However, I always picture Walmart when I think of typical cheese availability. There’s nothing but monterey jack, pepperjack, and cheddar! I should actually mention that in the review. Lots of people simply will not have a Save Mart or Raleys in their location, and might not have access to even any parmesan cheese at all! 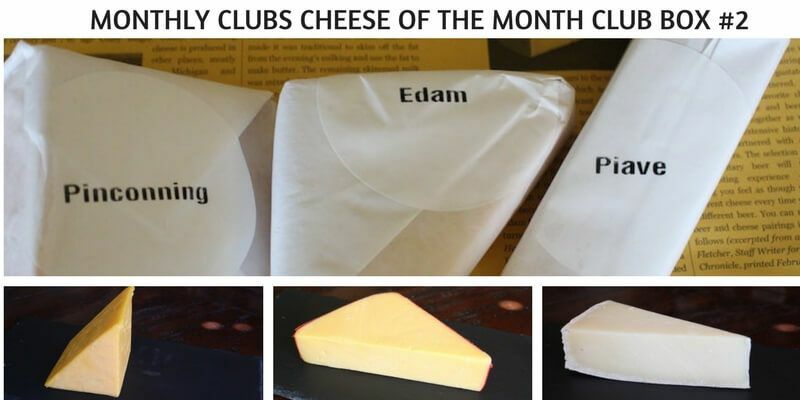 I have seen so many month clubs but have never seen cheese of the month club. 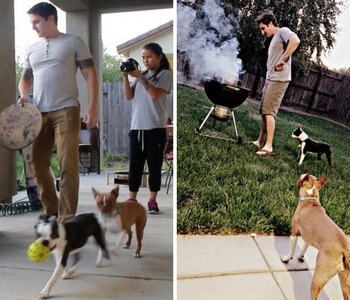 This is so new to me. I love cheese but unfortunatley the traditional supermarket stuff gets boring. I am absolutely going to show the people in my household this as we all love cheese. Not to mention I am diabetic and cheese works very well for my diet. I cant wait to try some. When you get tired of yellow cheddar, pepperjack, and mozzarella, then the cheese of the month club is a great way to expand. I particular loves the strong cheeses that get sent out! I love that you broke down the price of the 3 hunks of cheese for us. $16 for half a pound of cheese is a lot! I think I pay $8 for a pound of cheddar at the local grocery store. However, like you said, it is about the experience and you do get ideas on how to use the cheese. I would definitely use this as a Christmas gift or birthday gift for one of my foodie friends that has evverything!